New pump or not new pump? With all these #showmeyourpump pictures filling up the internets, I thought I’d share some of my thoughts around my pump choices. I first started pumping in 2000 with a minimed 508. I loved that pump because it was what gave me my first taste of the freedom of different basal rates throughout the day and to be able to take a meal bolus with the touch of a button. I still have my old 508 along with a set of batteries and a couple of reservoirs – just in case. When minimed’s (or was it already Medtronic by then?) first paradigm pump came out – the 511 – it was the natural “next pump”. However, if I remember correctly, the 511’s features were about the same as it’s predesessor; it was mostly the outer physical aspect of the pump that was upgrated at that point. I didn’t stick with it for long. Cozmo was the first “smart pump” on the market and I was lucky enough that France was the second country in the world where it was available. It came out in the US in late 2002 and Smiths Medical decided to use the World Diabetes Congress in August 2003 in Paris to launch the pump to the rest of the world. I got my first Cozmo about a week before the WDC. Any time I have needed to switch pumps since then (for warranty or malfunction issues), I have always chosen to stick with the Cozmo despite the fact that all pump manufactuerers have come out with several newer pumps over the last decade and despite the fact that the Cozmo itself has no longer been available since 2009. In France, all insulin pumps and pump supplies are ordered through specialised medical supply companies. They buy the pumps and supplies from the manufacturers and patients “rent” the pump and buy supplies from these third party suppliers (covered, thankfully, by French social security – the famous “Sécu”). So, lucky me, even though Smiths Medical took their pump off the market, my supplier still has some in stock and it is still avalable to me – at least until they run out of reservoirs. After 11 years, I still love my Cozmo with its personalisable menus and features. 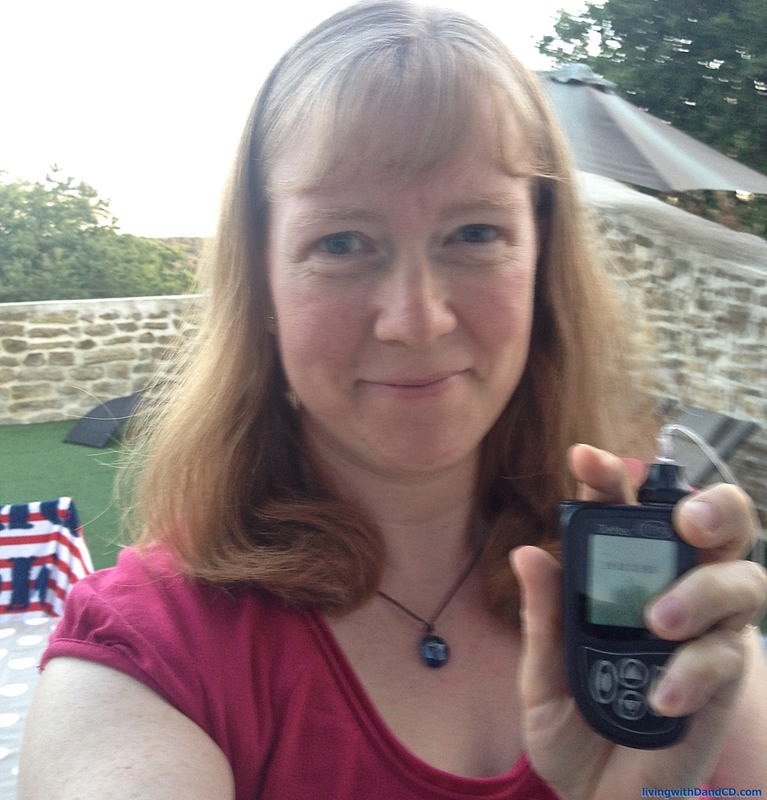 I choose to use an insulin pump partly because it makes it easier to adapt my diabetes to my lifestyle and I love that I can adapt my Cozmo to my own habits and needs in terms of diabetes management. When you look at some of the unique features of the T:slim, the Omnipod or the Snap pumps, it is disappointing that those are not at least options here. With the choices available to me and my own preferences in terms of features that are important to me in a pump, I chose to weigh the pros and cons of staying with my Cozmo or switching to an Animas Vibe. To get to know the Vibe a bit better I talked with a nurse educator at my pump supplier and she showed me some of the main features. I talked to people using the Vibe locally and on social media to get their impressions. I posted detailed questions on diabetes forums asking which of features I love on my Cozmo might also be available on the Vibe. Finally, still unsatisfied that I didn’t get the nitty gritty of the comarison that I was looking for, the geek in me decided to download the user manual, which I read cover to cover. The Vibe looks like a great pump and I know many people who use it and are very happy with it. It has certain features that I would like to have on a pump and don’t have today, like showing my dexcom graph, or different insulin sensitivity factors at different times of day. I would trust it’s waterproofness more than my current 4+ year old Cozmo and I could use software like Diasend to compile a majority of my diabetes data. These would be definite advantages of switching. However… after much thought, there are still too many features on my Cozmo that I use daily or weekly that are not available in the Vibe (or any other pumps available to me) that have made me decide to stick to my status quo. All these years later, I am still disappointed that Smiths Medical decided to leave the diabetes business. They had a great product and I will continue to use it as long as I still have access to replacements and pump supplies. If you use an insulin pump, I’d love to know what features were deciding factors for you in chosing your particular pump. This entry was posted in Uncategorized on July 21, 2014 by Andrea. Great – and thoughtful – piece. If it ain’t broke, don’t fix it, I always say. The deciding factor for me when upgrading last year was CGM compatibility and CGM accuracy. I waited over 12 months after I was due an upgrade to wait for the CGM I wanted to be released in Australia. I used a pump for a couple years – being waterproof was a huge factor. (I went with Animas). Pump shopping can be a bit rough! I have the OmniPod, but I know it’s not available for you. Good luck selecting! Happy to have found your blog through #dblogcheck! I’ve been with Medtronic for 17 years! I mainly went with them because my endocrinologist at the time recommended it but I’ve stuck with them because I have a huge stockpile of supplies now. With that being said, I do love how it integrates with the CGM (graph is on the pump), I like how it has buttons and sounds that I can recognize even when I can’t see the pump, like when I’m wearing a dress. Their customer service overall is really good too. Good luck in “pump shopping”! I have always used the Omnipod & my daughter uses a Medtronic but I have wondered a lot about the Cozmo given how passionate most users are about that pump. Many of the features you love are ones that I value as well — change is especially hard when it is unclear whether it will be for the better. Keep us posted on your choice! Hot damn, the cookies in your header look delicious!!! I wrote a whole big post about the different pump options last year. In the end I went with Omnipod because it just happened to have the features that I really wanted. I don’t know if I’ll be on it forever. If Dexcom finally joins another pump, maybe I’ll switch. But maybe I’ll wait for the bionic pancreas. I just make the best decision for the current situation and will wait to see what happens.